Lisa Miller is the owner and founder of Natchez Brewing Company. Originally from Plymouth, England. She met her husband Patrick Miller in 1998 while he was in the Marines. After some time they lost touch. In 2001 Lisa moved across the pond and resided in Connecticut. Her career as a dog groomer led her to established her own grooming business in 2009. Our recipes and brews created by Patrick Miller, who was born in Natchez and raised in the Miss-Lou (the name of the area... Natchez MS and Vidalia LA being separated only by the Mississippi river). At 18, Patrick left the area to join the Marines, and became a military police officer providing security on Marine One, the Presidential Helicopter. After his completed service, he continued his law enforcement career in Washington D.C. for many years until he joined the Park Service and was transferred to Asheville, North Carolina. It was here in Asheville that his love for making craft beer was ignited. In 2010 Patrick and Lisa became reacquainted, then in 2012 Lisa moved to Asheville where Patrick introduced her to craft beer. Together they shared the passion to create something that was their own. Soon thereafter, they were married and moved back to Natchez to be closer to family and raise their 3 daughters. Tours are available Fridays and Saturdays only and a reservation is required. Please call 828 788 3315 for reservations. Facebook and Instagram for the what is happening at the brewery and all our latest information. While we are usually brewing, packaging, cleaning etc during the day during the week, packaged beer is available to purchase to go. The Taproom is available to be booked for private events, please contact us natchezbrew@gmail.com for information and availability. Was the first built for Captain Thomas P. Leathers, at Crayfish Bayou, and ran from 1845 to 1848. It was a fast two-boiler boat, 175 feet (53 m) long, with red smokestacks, that sailed between New Orleans and Vicksburg, Mississippi. It was built in Cincinnati, Ohio, Leathers sold it in 1848. It was abandoned in 1852. Was funded by the sale of the first. It was 191 feet (58 m) long. Leathers operated it from 1848 to 1853. On March 10, 1866, it sank at Mobile, Alabama due to rotting. Was built in Cincinnati, Ohio. It was 270 feet (82 m) long, had six boilers, and could hold 4,000 bales of cotton. It operated for six weeks. On January 1, 1854, the ship collided with the Pearl at Plaquemine, Louisiana, causing the Pearl to sink. A wharf fire on February 5, 1854 at New Orleans caused it to burn down, as did 10-12 other ships. Was also built in Cincinnati, as Captain Leathers returned there quickly after the destruction of the third. It was also six boilers, but this one could hold 4,400 cotton bales. This one was used by Leathers until 1859. In 1860 it was destroyed while serving as a wharfboat at Baton Rouge, Louisiana. Was again a Cincinnati-built boat. The sixth Natchez, owned and commanded by Captain Thomas P. Leathers. If there was a faster boat on the Mississippi, nobody had proven it by 1870. It was 273 feet (83 m) long. The capacity was 5,000 cotton bales but the power remained the same. It helped transport Jefferson Davis from his river plantation home on the Mississippi River after he heard he was chosen president of the Confederacy. Even after the war, Davis would insist on using Leather's boats to transport him to and from his plantation, Brierfield. On March 13, 1863, it was burned either by accident or to keep it out of Union hands at Honey Island. Remains were raised from the river in 2007. Was launched August 2, 1879 by the Cincinnati Marine Ways. It was 303.5 feet (92.5 m) long, with a beam of 45.5 feet (13.9 m), 38.5 feet (11.7 m) floor, and 10 feet (3.0 m) hold depth. It had eight steel boilers that were 36 feet (11 m) long and had a diameter of 42 inches (1,100 mm), and thirteen engines. It had 47 elegant staterooms. The total cost of the boat was $125,000. Declaring that the War was over, on March 4, 1885, Leathers raised the American flag when the new Natchez passed by Vicksburg, the first time he hoisted the American flag on one of his ships since 1860. 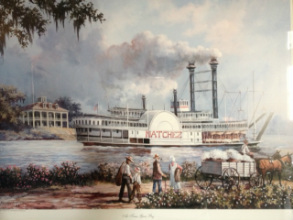 By 1887 lack of business had stymied the Natchez. In 1888 it was renovated back to perfect condition for $6000. In January 1889 it burned down at Lake Providence, Louisiana. Captain Leathers, deciding he was too old to build a new Natchez, retired. Jefferson Davis sent a letter of condolences on January 5, 1889, to Leathers over the loss of the boat. Much of the cabin was salvageable, but the hull broke up due to sand washing within.